With Superman wanting to give up his powers and General Zod fixated on ruling the Earth, can the world avoid annihilation? 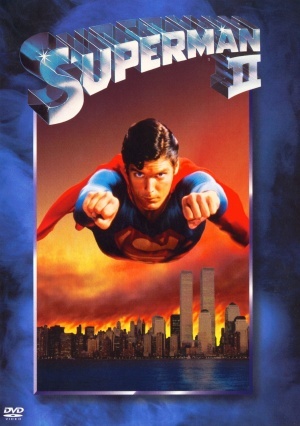 Luckily, Superman II continues on the same path as its predecessor playing Superman as an idealist of the American Way, ‘Good afternoon Mr President… I won’t let you down…’ For a large portion of the film Superman takes a step back from his duties and instead explores his human side leading to an absence of Superman involved action. This void is filled eagerly by the villains causing havoc in Superman’s absence, and although the action is entertaining, it could leave the hero’s fans disappointed. Terence Stamp as General Zod exudes a light hearted menace while constantly making unknowing comic remarks such as asking Lex Luthor, ‘why do you say this when you know I will kill you for it.’ Stamp’s General Zod is a perfect match for Superman, allowing a threat to humanity to be as preposterous as they come – his early victory results in a hilariously bored Zod sat behind the Oval Office desk. General Zod combined with his two accomplices are as physically able as Superman – a confrontation sorely missed in the original. The film indulges in a suitable versus action sequence which makes a change from Superman catching helicopters and putting out fires. A taxi driver in this scene sums up the viewers thoughts, ‘man this is gonna be good,’ and it truly was: explosions, cars being launched through the air and people flying around after each other create a stunning array of visual light-hearted pleasure. These action sequences are more associated post X-Men, which was twenty years later, but this was an incredible spectacle in 1980. With strong special effects, great villains and a light hearted tone, Superman II keeps the red caped heroes fires burning. If not as consistent as the first film, due largely to a lack of Superman himself, it certainly contains more action.